McDonald’s has rolled out a new logo in France, replacing the iconic red background of the golden arches with green. Here’s some info from ZLOK design blog, and here is where I saw the story originally (although I can barely stumble through the French! ), at TerraEco.net. There has been so much fluff news lately about “easy ways to go green.” You know what’s an even easier way to go green? Changing a logo. 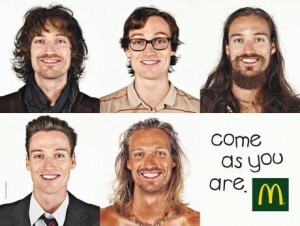 And adding some hippies into your advertisements! If anyone has friends in France, I would love to hear more about how this transparent green-washing has been received there.